G’day, forex mates! Australia is scheduled to release its jobs report tomorrow at 12:30 am GMT, which means that the Aussie will very likely get a volatility injection. And if you need a quick recap on what happened last time, as well as a condensed preview of what’s expected this time around, then today’s write-up is just for you. Australia’s October jobs report was very good overall, so the Aussie jumped higher as a knee-jerk reaction. However, follow-through buying was only limited because of steady gold prices and the risk-off vibes at the time. As for some deets, the October jobs report revealed that the Australian economy generated around 32.8K jobs, which is more than the expected 20.3K increase. Even better, the stronger-than-expected jobs growth was due to the 42.3K increase in full-time jobs, which marks the fifth consecutive month of increases in full-time employment. Unfortunately, the strong increase in full-time jobs was partially offset by the loss of 9.5K part-time jobs. As for the other labor indicators, the jobless rate held steady at 5.0%, which is the lowest reading since April 2012, and contrary to expectations that the jobless rate will tick higher to 5.1%. Even better, the jobless rate held steady even as the labor force participation rate increased from an upwardly revised 65.5% (65.4% originally) to 65.6%, which means that the Australian economy was able to cope with the influx of new and returning workers. Most economists forecast that the Australian economy only generated around 20.0K jobs in November, a weaker increase when compared to the previous month’s +32.8K. Economists also think that the labor force participation rate and jobless rate will both hold steady at 65.6% and 5.1% respectively. The employment sub-index of AIG’s performance of manufacturing index (PMI) fell by 3.2 index points to 49.4. Do note that the reading is slightly below the 50.0 stagnation level, so employment in the manufacturing sector contracted. The employment sub-index of AIG’s performance of construction index (PCI) deteriorated even further, falling by 3.7 index points to 44.3, so payroll numbers in the construction continue to shrink. As for the employment sub-index of AIG’s performance of services index (PSI), that fell by 4.4 index points to 52.9, so jobs in the service sector still increased in November, albeit at a slower pace. The employment sub-index of the NAB monthly business survey improved from 7 index points to 9, so NAB apparently found anecdotal evidence that jobs growth accelerated, which contradicts AIG’s findings. Well, if we compare the readings for October and November, we can see that there is a strong historical tendency for the November reading to be stronger than the October reading. Nevertheless, economists are apparently a pessimistic bunch since there are lopsidedly more upside surprises than downside surprises over the years. 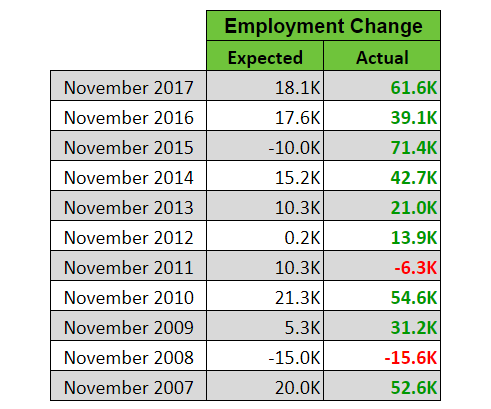 In summary, there is a consensus that jobs growth slowed in Novembers. That consensus is supported by AIG’s findings since AIG reported that employment contracted in the manufacturing and construction sectors, while jobs growth in the service sector slowed down. However, this is contradicted by NAB’s findings since NAB’s latest business survey found anecdotal evidence of stronger jobs growth in November. Historical data also bolster the case for a stronger November reading since there are significantly more instances where the November reading has been stronger compared to the October reading. Moreover, historical trends shows that economists tend to be too pessimistic with their guesstimates since there are lopsidedly more upside surprises for the November reading. And that skews probability more towards a potential upside surprise. But as always, just remember that we’re playing with probabilities here, so the risk for an downside surprise is still there. Also as always, do keep in mind that traders usually have their sights on the actual reading for net employment change, and the Aussie’s knee-jerk reaction is usually (but not always) dependent on how the actual reading turns out. As for follow-through buying (or selling), that usually depends on whether or not full-time employment continued to grow, although the other labor indicators also come into play. However, the Aussie’s price action is also sensitive to risk sentiment and gold prices. And if you didn’t know, you can keep an eye on those in our Live Market Rates.